Flaunt Gorgeous Curls with Less Damage and Less Frizz! 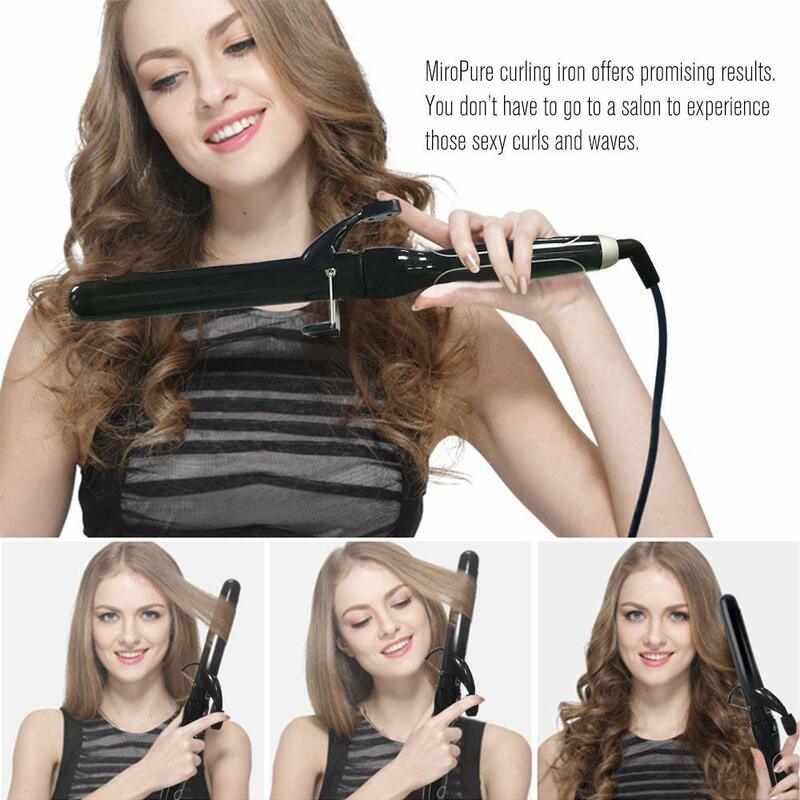 MiroPure curling iron creates bouncy curls with ceramic coating to eliminate frizz and reduce heat damage. 410℉ high heat locks in the curl quickly for a flawless, long lasting style. Be Your Own Stylist.Achieving a Perfect Hairstyle at Home. Its quick use and easy of access makes creating sleek,bouncy curls and waves easy to do. Ceramic irons are efficient professional curling irons because they produce softer curls and conduct heat evenly—which prevents the hair from damage and abuse.It leaves your hair easy to manage. Universal Voltage Features& Exclusive Heat Resistant Silicone Storage Cover:100-240V,Convenient for traveling and on the go. Elegance is the only beauty that never fades in your journey. With heat resistant silicone storage cover, you don’t need to wait your hair curler cooling down when you finish styling, and it’s convenient to store. Safe Insulated Tip & Auto Shut off Function for Security. 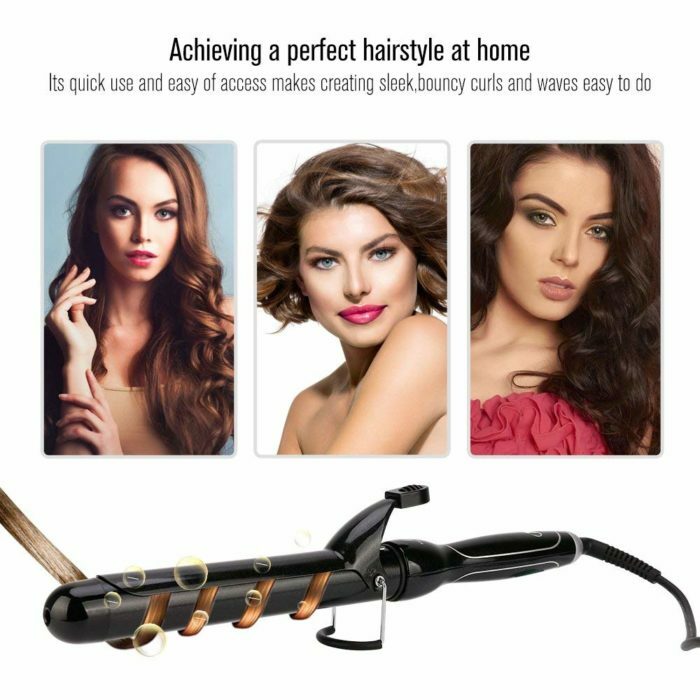 Automatic shutoff, ready indicator light, and safety grip tip for two-hand use improves the safety of the hair curler to prevent accidental burns and misuse. Built-in stands provide a steady resting place. You’re protected by a 360 day, no-questions asked money back guarantee and world class personal customer service. 6 Different Heat Settings for All Hair Types: MiroPure curling iron can be adjusted to 6 different settings from 160°C~ 210°C (320℉~410℉). Suitable for all hair types: Coarse,thick, thin, fine, bleached. Be your own stylist at home! Be your own kind of beautiful! Stylists don’t understand your request, waiting in line for a long time? Do you want flaunt gorgeous curls? 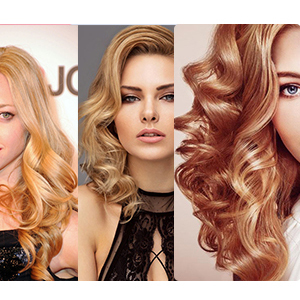 Solve them all with MiroPure Professional Hair Curler now! Easy, simple and safe! You can experience gorgeous sleek salon hair styles every day at home, in hotel or anywhere you want. 6 heat settings to provide you with total control for all your hairstyling needs. No time wasting, No burning on your hair, No pain No hurt to your scalp and hands, No fatigue at Salon…..
Be Your Own Stylist. Achieving a Perfect Hairstyle at Home. Positive Temperature Coefficient(PTC) Heating Technology: Heats up quickly with positive temperature coefficient. Its quick use and easy of access makes creating sleek,bouncy curls and waves easy to do. MiroPure, Loves Your Hair. 6 Different Heat Settings for Different Hair Types. 4. 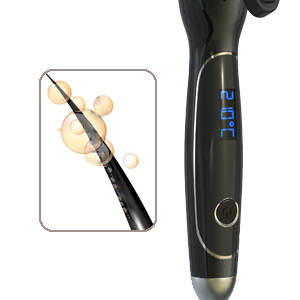 Thick, coarse hair: 210℃/410℉ and fast results. MiroPure Curling Iron, Your Professional Stylist. 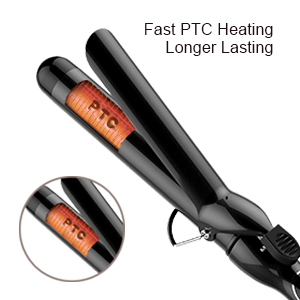 Positive Temperature Coefficient (PTC) Heating Technology: Heats up quickly with positive temperature coefficient (PTC) technology, the curling iron heats up quickly to desired temperature setting within 60 seconds, reducing heating response times. 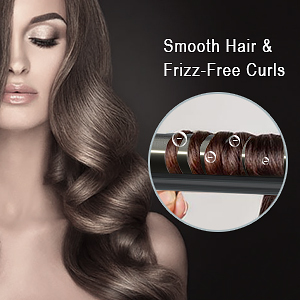 Its quick use and easy of access makes creating sleek,bouncy curls and waves easy to do. Ceramic is considered significantly better than metal because it heats evenly and from the inside-out, rather than just frying the outside, which is good news for your hair. Ceramic protects hair from over-styling with even heat distribution that penetrates hair quickly from the inside out for less hair damage and fast results you’ll LOVE. accidental burns and misuse. 60-minutes auto shutoff gives you added peace of mind with every use. With heat resistant silicone storage cover, you don’t need to wait your iron cooling down when you finish styling, and it’s convenient to store. Question: How do you set a heat setting? I think I have it set, but the digital temp continues to rise. Answer: First of all, you need to long press the power button to turn it on and then short press it to set the temperature which you prefer. After you have set the temperature, the device will be heat up as the digital shows the heat up temperature until the one you original set. Question: Will I need any transformer for use in Armenia? Answer:I’m sorry I have no idea. If you contact MiroPure ,they have wonderful customer service. Question: Will I need a plug adapter for use in New Zealand? Answer: Yes, it is the regular US plug, so that if you use in New Zealand, you need a plug conventer. Question: how long is the barrel ? Answer: The Barrel is to be exact, 8 7/16 inches long. So pretty much 8 1/2 inches long. I like the lenght of This curling iron. As a Hair Stylist, I can use it on so many different hair stlyes and different hair types. 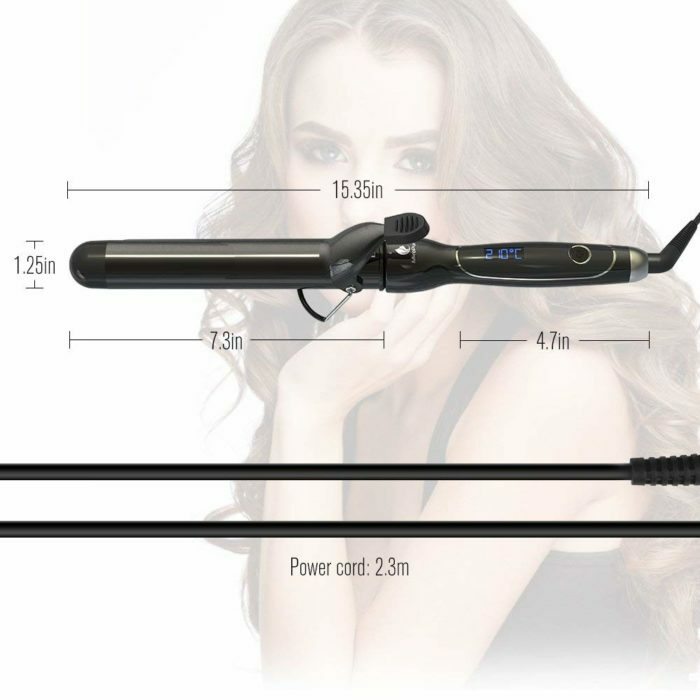 You can use this curling iron to create long beach wave hair or use it to create tighter curls. Answer: This device can be used with 100-240V with the US plug. If you just use this in the US, you do not need any transformer or conventer, but just need plug in. Answer: The power cord is 2.3m, and you can check the the detail size of this curling iron on the 8th main picture of this product page. Question: Do i have to be carefull when Curling my hair if i use hairspray for better curls will my hair fall out with heat ? Answer: As you would do with any other heating tool. I find that this curling iron holds a curl that lasts me approximately 2 days without using any hairspray. If it were me I would apply hairspray at the end of doing my hair, that way it doesn’t damage my hair as much. Hope that helps! Question: How long is the barrel? Question: Can you touch the tip? Answer: Yes. the Tip is not heated. Question: Does the clamp hold hair well or is it loose allowing the hair to fall out? Answer: Its not super tight, but tight enough, at least for my hair. I bought this in a pinch because my favorite iron died. I wasn’t expecting much but I was impressed with this for the price! I have frizzy hair and have to curl it every day to calm it down. I also use the curling iron to straighten my roots before curling the ends. This has eliminated my frizz and leaves my hair super shiny. I’m writing a review for free stuff but I am happy to do it because my review is the truth! This curling iron works great! Heats up really quick and gets very hot! The heat makes my curls stay all day! I will be purchasing the straightener made by this brand next. I love this curling iron. The heat settings are digital so just tap the power button to raise the heat. This is a very nice curling iron with good setting options. This is a larger iron so you we like the large loose curls it makes. It is also so smooth that your hair doesn’t get stuck in the iron. It heats up nice and quick so you do not have to wait long to use it. Just got it today, love the sleek barrel and the easy digital temp display. I have long unruly hair and it left smooth shiny curls. 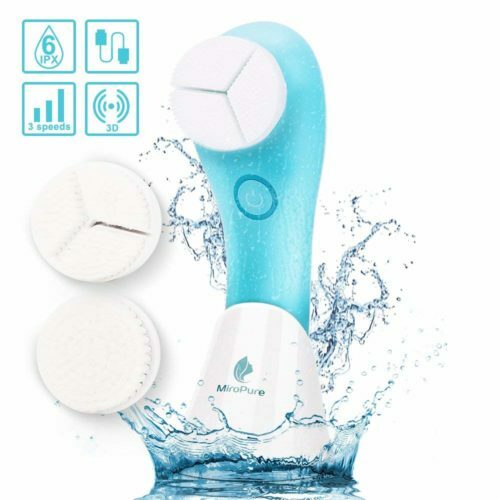 Product quality is very high and it works really good, this is my second miropure product and I’m really happy of my choice. You won’t be disappointed! Exactly what I was looking for! The longer barrel makes it so much easier. Curls are coming out so great. Love it. Love the long barrel for my daughters long hair. Gives a really nice beach wave! A must buy. Smooth Barrel, good for long hair, really heats up in seconds, glove was very helpful when teaching a tween for the first time. 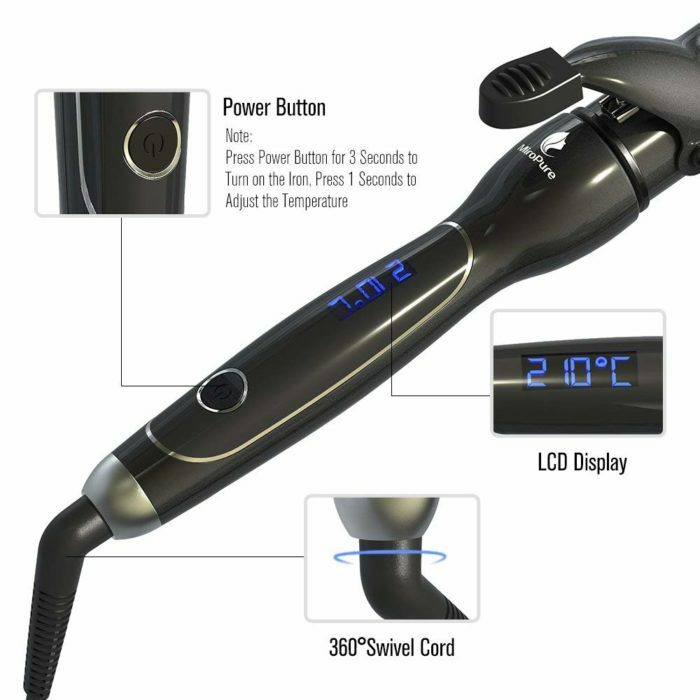 This curling iron heats up fast but also smooths out hair while curling. I will be buying this curling iron in the other sizes I use as well. 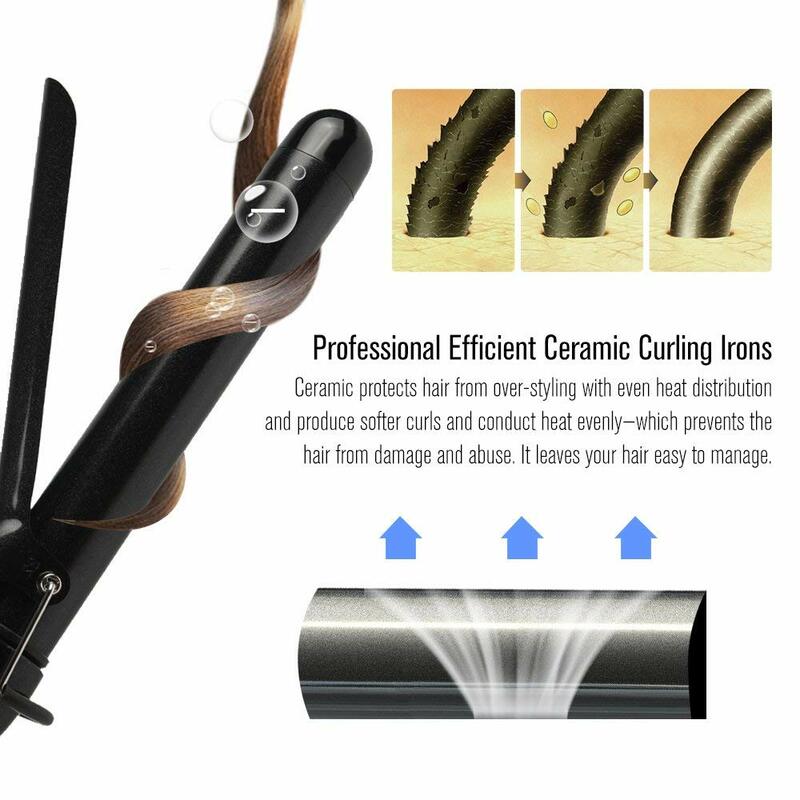 Professional curling iron for a reasonable price. Best curling iron I’ve ever own! 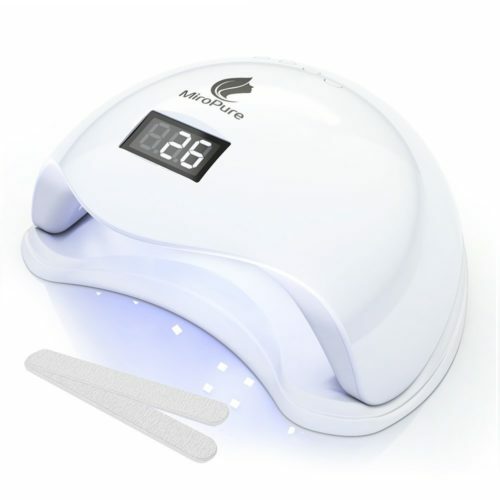 Easy to use and I really like the ability to use different temperatures! Came quickly! Very glad I purchased this item! Beautiful curling iron. Heats up fast and leaves really nice curls! 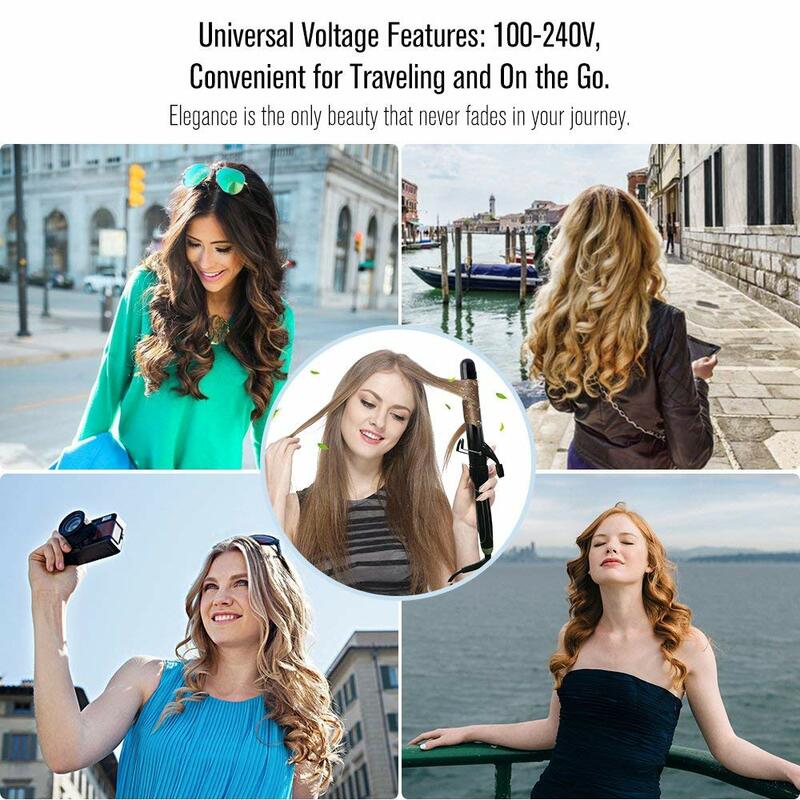 Loved the curling iron, it is easy to to use, it heats up fast which is convenient for my fast pace life. I loved the fact that it comes with a glove to avoid any burns. I would recommend this product to family and friends. Gets very hot fast. Grips hair well. Makes beautiful beach waves in my long hair. The length of the barrel is not short which is what I need. Cord is long. 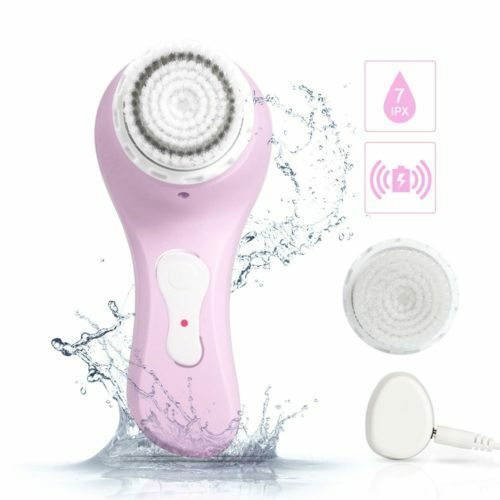 I just received the product and it has been working really well so far. Good quality, heating really fast. This curling iron is great. I have one issue with it which isn’t huge… The clamp isn’t very strong. I have super think hair so a stronger clamp helps hold my hair. It’s not super weak which is why I’m still giving it 5 stars. Easy to use! Great product! Great product! easy to use and the glove is awesome so you can work with your hair and the iron comfortably! Can’t beat the price for $12.00. Works great ! Great value for the price! Product features meet my expectations exactly – everything is true to the descriptions. The hair pins and a small glove that came with the iron are very helpful, which I didn’t see any other sellers provided. And it heats up very fast, so you don’t worry about prehitting and it comes very handy especially when you’re on the go or in a rush Onlyhing though: the curling iron was a little bigger than expected, but if you check the size carefully, it shouldn’t be a surprise! Overall, I’m very satisfied. A lot of heat options! I love the length and heat options on this curling iron. The only thing I’d like to see changed is the clasp strength on the curling iron. It’s a little weak and does the job, but having a firmer clasp to hold onto hair would be more beneficial. I have long thick hair and not every curling iron suits my hair but this one has been good so far. I LOVED the packaging. It’s very sleek and comes with a nice sleeve as well. It is a very attractive iron. It heats up quickly. I like how you have to hold the button for on/off because I accidentally push it all the time while twirling my hair. I do wish the clip to hold the iron off the ground was a little further back but it is nice to have. I have a mat I use so I don’t need to use the clip all the time or I just leave the clip open even while I curl. The 1.25 leaves the curls a bit tighter than I want but they look awesome the next day. Great customer service as well. Thanks MiroPure. It’s new but so much better than my last curling iron. Works great so far! The item we received was defective. We tried a number of different power sockets but the device was totally dead. Returned to Amazon for a refund. Update.. I was contacted by the seller who offered a free replacement for the defective unit which arrived a few days ago. The new unit works as advertised with no issues and my daughter is very pleased with her new curling iron. I have update my review to 5 stars. I had no experience and the straightening brush was quick and easy to use to see the results. Everything about this is the best thing-love it! I have very thick hair and took a chance with this item. Not knowing the brand, I was unsure. Oh my gosh, I wished I’d ordered this years ago. This is the best iron ever. Does a great job, holds the curls all day. Plus it has a long thick cord, which is so needed. Love this!! Favorite curling iron I have every had! This is great! I have had many curling irons, and this is by far my favorite. It makes your hair smooth and silky. It hears up fast and the temp stays even and consistent. Very nice and amazing price. 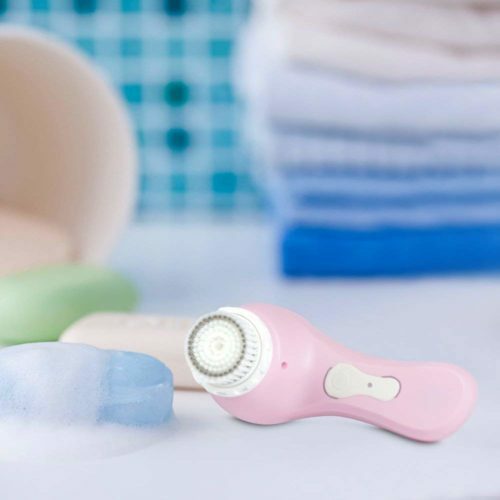 Love this, super easy to use, the packaging is really cute and comes with a silicon cover to put on in case you need to pack it and is still hot. Love this iron! Super hot and heats in seconds. Nice curling iron. Well made considering price. I am terrible at using it, but that’s user error and not a function of the product. I would recommend this product. Please note: seller offers product compensation for truthful reviews. The best curling iron !!!!! I received this curling iron at the beginning of April and have actually really enjoyed using the product, but it recently stopped working for no apparent reason (no drops, power surge, etc.). Prior to it not working it curled my hair well and I had no complaints. Update: Micropure sent me a replacement curling iron. I’ve only had it about a week, but so far it is working well. I just opened my curling iron and am very impressed. It looks very expensive for the price paid. I am hopeful that it will give me amazing curls. Love this iron!!! It is hot but glove handles that. Curling irons are suppose to be hot! 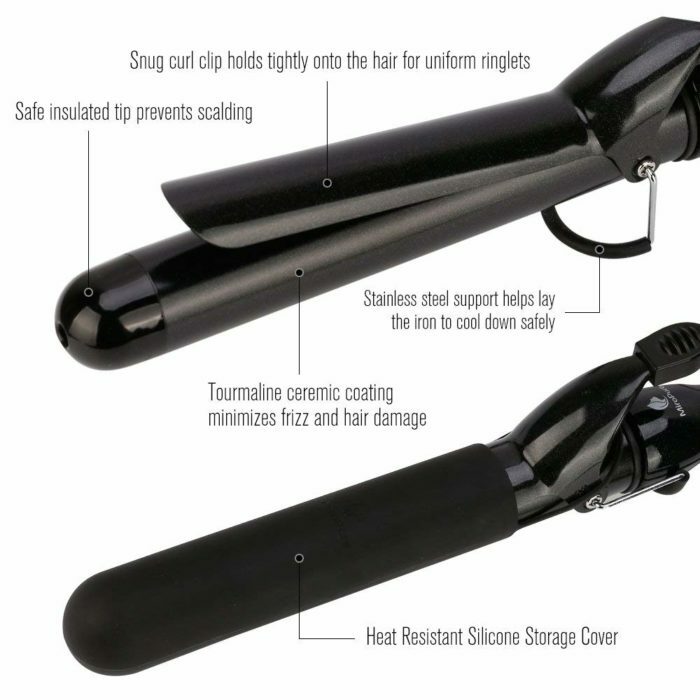 Perfect, simply designed curling iron. The folks at MiroPure contacted me after I initially posted a 3 star review because I didn’t realize you can adjust the temperature of the curling iron by pressing that main button a few times after it’s turned on. My initial 3 star review was because I thought the iron could only reach 350 degrees, which is not what is advertised. But, this morning I was able to heat it up to 410 degrees no problem because of MiroPure’s explanation. The tool is stylish, heats up quickly, and looks great. It’s exactly what I was looking for in a curling iron. My hair looks great after using it. However, God forbid anyone leaves a less than 5 star review… I was bombarded with five emails trying to get me to update my initial review. I appreciate that the company wants to help out its customers (or at least keep its nice rating on this product) but the amount of emails were a little much. Of course I’m going to update the review because I was mistaken and the product works exactly as advertised, but can we chill on the constant emails? Gets hot very quickly — was surprised the barrel is kinda glittery looking, very cute. Great curling iron. Heats quickly, nice curls. I don’t feel like it’s damaging my hair when I use it. I LOVE this curling iron! I’m a curling newbie. I can’t curl my way out of a paper bag. But this curling iron is nice, despite my shortcomings! The barrel and clip are smooth, no hair pulling on them. The tip is even nice and cool when I don’t use the glove! Great product! In love with this curling iron. It heats up so fast and my curls last a long time. I also appreciate that it comes with the glove to help to avoid burning your hand. I usually use this for loose curls and it looks amazing. When I bought this I saw a lot of 5 stars. Made me suspicious. I want to give a fair review that others can trust. Pro’s – Light weight. Easy on / off (Another review said poor set up/easy to hit while using, I strongly disagree.) Several settings 310 – 410 degrees. 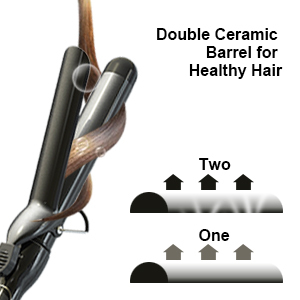 Long barrel – great for longer hair. Long cord. Con’s The clamp down on your hair isn’t as solid as I hoped. Don’t want it too hard, makes crease but this one is a little too light for my liking. Overall, good curling iron. Just won’t give 5 stars as it doesn’t do something better/different than other curling irons I’ve had. Heats fast,holds hair well,easy to use. Loving this curling iron. It heats up quickly, and i love that it comes with a cover so that I can put it away right after I’m done. Rich looking great accessories and easy to use….if they have a flat iron I’m buying…. I really like this iron. 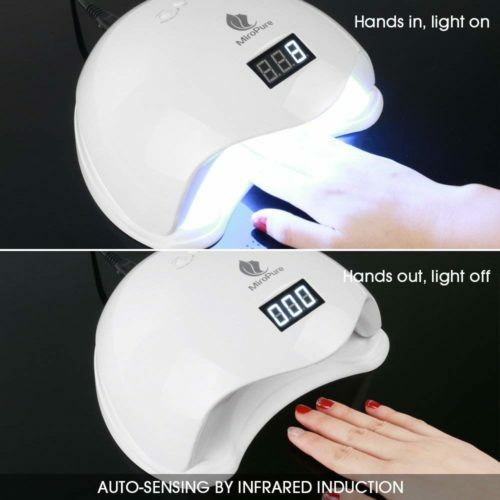 What I love the most is the glove, as I am that person that will forget and go to put my finger on the top of the iron to control it…lol…clips are plastic and may not hold heavy thickhair, but otherwise this unit is worth the money all day long. This was a fine item to have in my beauty drawer. Works great. Beautiful curls. The glove is great. I am a klutz so the glove really comes in handy so I don’t burn myself. The curling iron does exactly what it’s supposed to: it tames my rat’s nest of hair and makes me look presentable.